Our oven was working but very slow to reach temperature, so a call to Fort Road was all I needed. The repairman came at the appointed time and installed a new igniter. The stove has been like new since then. Prompt service, reasonable pricing. I recommend them. Replace bathroom wide spread faucet and install separate shutoff valves. Prompt response, and when Will realized that he couldn't come when he said, he made sure that Owen could do the job, finished within hours of my first call-out. Owen did a thorough job, he was pleasant to deal with, and the cost was reasonable. I'll call them again (but not too soon, I hope). Thanks Doug was a pleasure to deal with you take care! Cam and his crew fixed a leaking roof that was improperly done by another company, and did a little more shingling for me. For what they did, the price was very reasonable, and he was careful to make sure it was done right. The plumber did a thorough job of cleaning out the drain below the bathroom sink. It works well now. I also worried that the bath drain was too slow, but he explained that the problem was likely caused by the fact that the ancient system had inadequate venting, so I was getting an airblock. I think he was right. Thanks Doug for taking the time to review our service. We are always glad to help. 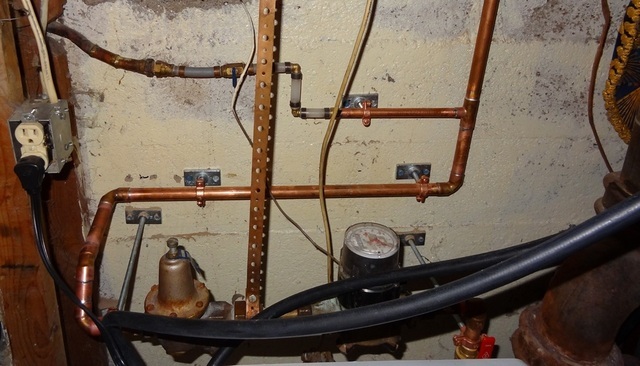 A leak in my ancient stack was repaired by Joe replacing the basement portion of the stack, and he also installed a backflow valve. Joe was knowledgeable, courteous and conscientious. Only one small criticism: he didn't phone ahead to let us know that his prior job was delaying him. Cleaned bathroom & kitchen drains, but using lazy flush technique from above. Other plumbers say you don't clean drains from above. Charged $195 for each drain, took a few minutes each. Also broke first one, THEN THE SECOND, basin strainer in the kitchen double sink. Offered to replace with strainers that he had on the truck. We are not happy with those strainers. He was obviously getting rid of poor strainers at exhorbitant prices. Don't bother with these sharp operators. Piper came quickly to clear a slow feed line. They replaced the old and now illegal lines, but I also had them install a new heater and rebuild the piping all the way upstream of the heater. Dorian discovered a failing drainpipe and came back the next day to fix. Good job, which renews my confidence in staying in this century-old house. Thanks Doug , I'll make sure Dorian gets the compliment. Century homes can be a challenge , we service several and have tons of experience with them. Thanks again.